X-Small - £81.99 Only 6 left! Small - £81.99 Medium - £81.99 Only 6 left! Halloween and rum go together like peanut butter and chocolate--harmonious, satisfying, timeless. Think about it, you never need to ask, “Who likes rum?” because the answer is (obviously) everyone! So if you instinctively pointed to yourself with your thumbs while shouting, "This guy!" then you are not alone. You already know what this Men’s Rum Pirate Costume is all about. 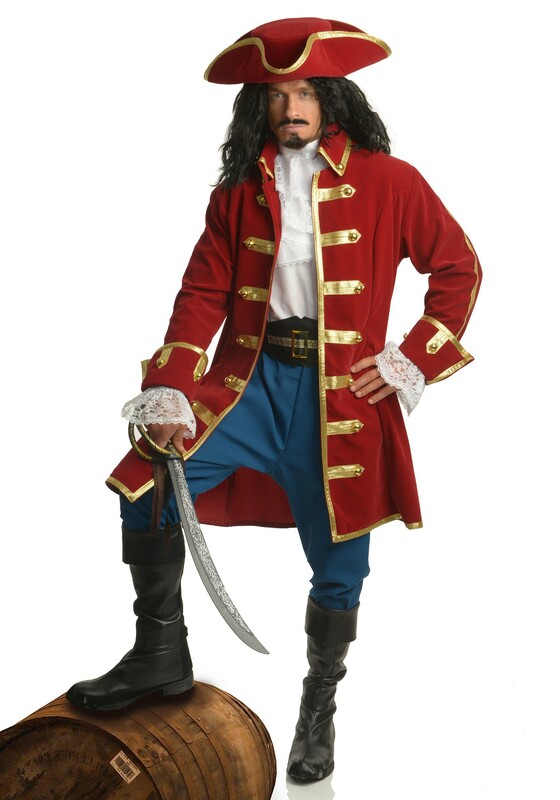 Swashbucklers are notorious for their love of the beverage, so you'll look right at home on Halloween when you wear this outfit and sip on your drink of choice with your crew. Of course, you'll also look right at home brandishing a cutlass against your foes on the high seas, too, but sitting back on the ship while enjoying some rum sounds like a much more relaxing time. There are, in fact, only two ways you could improve upon this near perfect costume. 1) Get yourself a parrot and train it to walk over to the counter and ask the barmaid for a refill for you (super bonus if you can train it to carry the drink back to your seat). And 2) bring your own treasure chest to use as a footrest wherever you go, so you can always be drinking your rum in a leisurely position while still looking totally in character. Other than those two costume hacks, this look is pretty much pure gold with its regal red jacket and blue stretchy pants. Oh, we guess you should also pick yourself a ruffly shirt and a pirate’s cap, unless you think you can teach your parrot to shop online for you while you continue sip on your cocktail. We wouldn’t put it past you. You’re a pirate, after all!